Increasing numbers of hedgehog droppings and begging juvenile birds on the lawn, cats hiding in explosions of foliage in borders... garden watching has been busy! 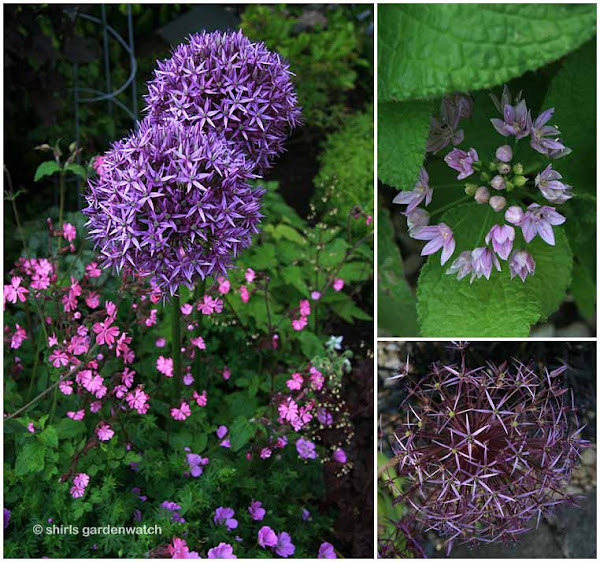 On the gardening front… there has been much weeding, dividing and replanting of plants too. 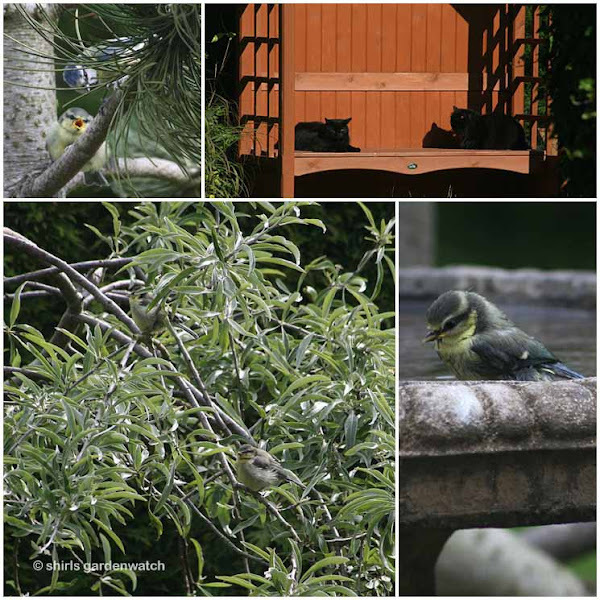 We’ve had lots of juvenile Blackbirds, Starlings, Chaffinches, Greenfinches and Goldfinches. Counting the Goldfinches when they arrive with the parents (especially on a rainy day like today) can be tricky when they are so small and they land on plants around the feeders. However, I’d guess they take the top spot for now. As for silly places for juveniles to explore, top spot goes to a couple of Blackbird juveniles (newly fledged I’d guess) that found themselves stuck and calling for food from my small greenhouse. Yes, the door was open a little but it doesn’t face a flight path the birds use and is tucked away in a corner with access that is limited even for me! 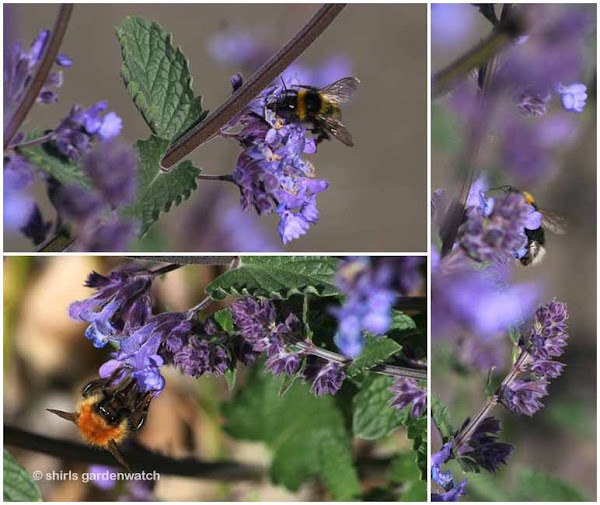 Feeding on Nepata Walker’s Low (Catmint) and Alliums a variety of bees have been spotted. I love to watch them busily make their way from flower to flower collecting pollen. I often stand with my camera but they don’t hang around for long. Butterfly sightings are a little more scarce at the moment but I expect the wet and windy weather is keeping them away. 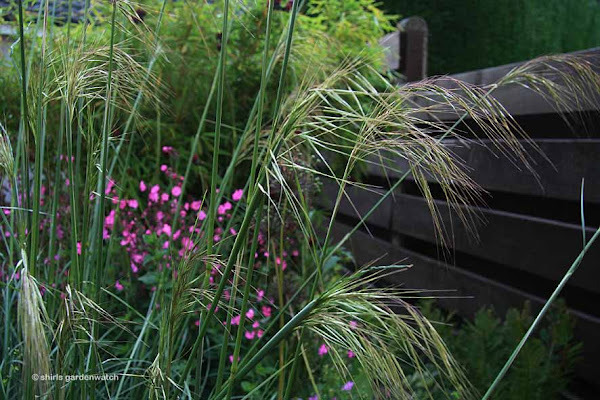 Come wind, rain or shine – you can’t hold back the growth on plants at the moment! In one month the garden has changed quite dramatically. 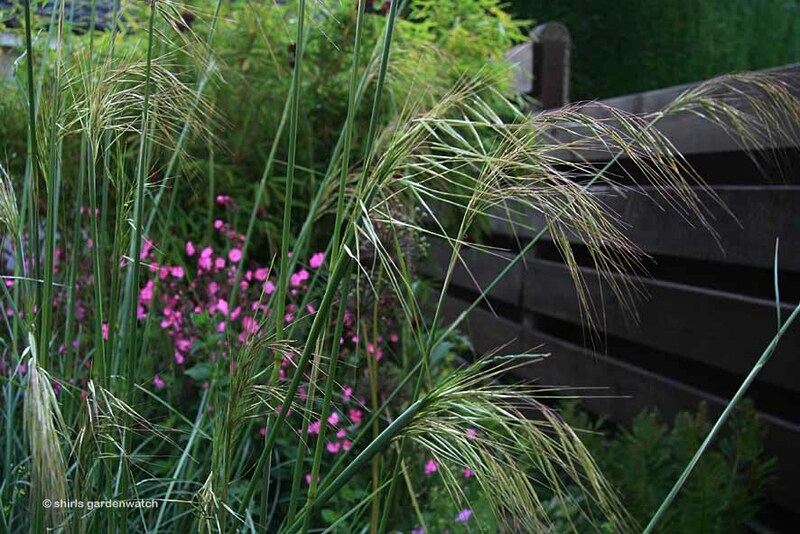 Catching the late evening sun last night was the new golden oat-like flowers of the ornamental grass Stipa gigantea emerging from stems that are reaching for the sky. Some staking is required here at the base to support the stems on windy days. 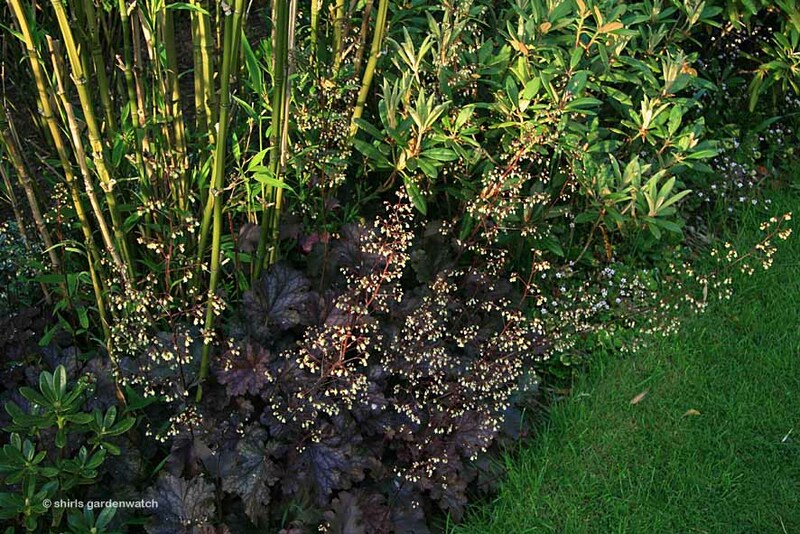 Hugging around the base of a golden stemmed Bamboo in my shadier back garden is a wonderful display of Heuchera fully in flower. These tiny flowers also attract bees which I am delighted about as I love this plant and keep dividing the ones I have to give greater carpets of ground cover which lasts throughout the year. This is the last spot to get the evening sun in my garden and it always makes me smile to see it. Also flowering in my garden at the moment, are a few dark Clematis and the wonderful (white with green markings) Miss Bateman. She has put on her best show ever this year! However, two years of hard, cold winters have taken their toll on my Wisteria and I’ve had few flowers there which is such a shame. There are flowers on woodland Strawberries, Chives, Thyme, Alpine Asters, Celmisia , Campanula, Dianthus, variegated Saxifraga x urbium (London Pride) but most of all there are many, foliage plants and shades of green in my garden at the moment which I love. 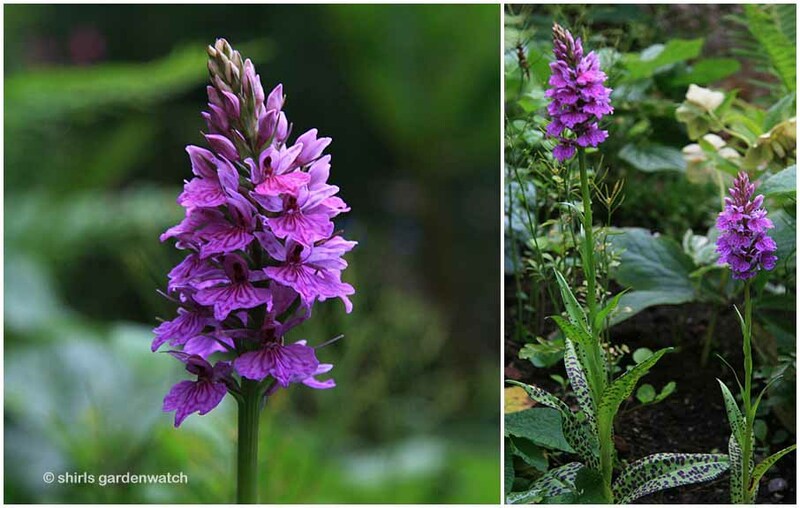 Hidden among ferns behind my garden gate, almost out of sight, there is one absolute treasure of a flower that I am particularly enjoying just now – the common spotted orchid. It has only been in my garden a year but I moved it from my grass mound when it emerged this year as I felt in drier weather it might not be so happy there. Update: Just spotted a post on wild orchids at Orchids, Nature and My Outdoor Life. I always enjoy seeing David’s posts on his walks with the wonderful scenery and plants he sees en route. Add to that he has orchids that have arrived in his garden all by themselves! Just brilliant :-) Perhaps you might want to see David’s latest orchid post too. 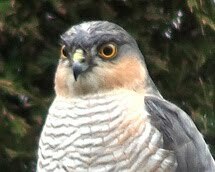 So that almost sums up the garden watching in my garden at the moment. I am still (slowly) working towards the point that I am able to put a liner down for my new wildlife pond. I probably won’t do this until September now as during August/September (weather depending) our Leylandii hedge will be getting its annual trim and I don’t want bits to blow down into the water. Last time I mentioned a new nest in my garden and a bird that is new to me. It wasn’t until I took video footage that I was able to ID this bird. Lol… the swallow was a red herring that I’ll come back to next time! High above my front door under a roof eave we saw the start of a House Martin nest. We had no idea if it would be completed with a number of birds seen flying back and forth between at least four houses beside ours. What a spectacle they made. Some evenings Swifts could be seen and heard flying with them too. So did they finish their nest? Yes they did! They were pretty quick about it too and I captured some great video footage which I’ll share sometime soon. The nest is cup shaped with the entrance high to one corner so it’s difficult to see much going on. Rain has prevented further video footage to get a closer look. Oh… I should say that our neighbours also have nests too. At least five houses and some have two nests! I’m also wondering if this is a particularly good year for pairs of House Martins nesting. This is certainly the first time our street has seen so many. Interesting, has anyone else been seeing this too? Perhaps you’ve another new nest in your garden this year. Please do share in a comment below. You have so many lovely plant compositions Shirl. I love the bamboo. It must be a clumping form.? Your birds nesting against the house are beautiful. We have a couple of swallows that build this type of nest. Ilove to watch them make and collect their little mud balls. It is amazing how beautiful the nests are. I can't wait to see the babies. We have catbirds nesting in our garden this summer. It is only about the second time. 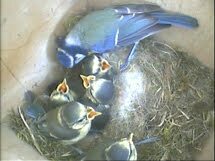 This time they nested where we could watch a lot of the comings and goings. Such fun. Shirl...so much to comment on...questions to ask...but got to the end of the post..feeling rather fulfilled.. happy..plain and simple. Your blog is full of interest and observation. Thank you for sharing this and will look forward to a Martin update. I can't tell you how much time I've spent trying to get good pics of all the bees on the catmint and have failed miserably. They jump from one flower to the next so quickly. I think I need to put the camera down and just enjoy the "buzz". Great pics and post. Absolutely splendid pictures! A pleasure to look at your site. Birds get into our greenhouse through open window. We have a plastic net type of grid over the door so they don't accidentally fly in but they hop along the eaves of the greenhouse and hop in onto the grapevine - then it is rescue time. Neighbours cats lurk in our garden and I have no guilt feelings when chasing them off. WE have had a canine house guest and her presence for a few days seem to have discouraged the cats from staying around - at the moment they just rush through! 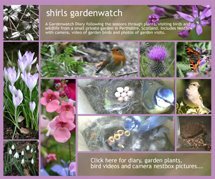 Hi Shirl :) Lots of lovely photos here and a very absorbing post. You are lucky to have the House Martins, they used to be a common sight around here but not so much any more. 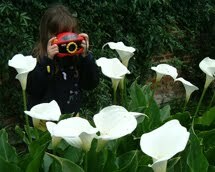 You have clearly been busy in the garden and put me to shame ;) The Orchids are beautiful, what a treat. The butterfly situation is worrying here, after a good start earlier, they have been nowhere to be seen for two or three weeks, even when conditions were favourable. My greenhouse gets invaded by adult Blackbirds. They are very partial to the strawberries growing in there. 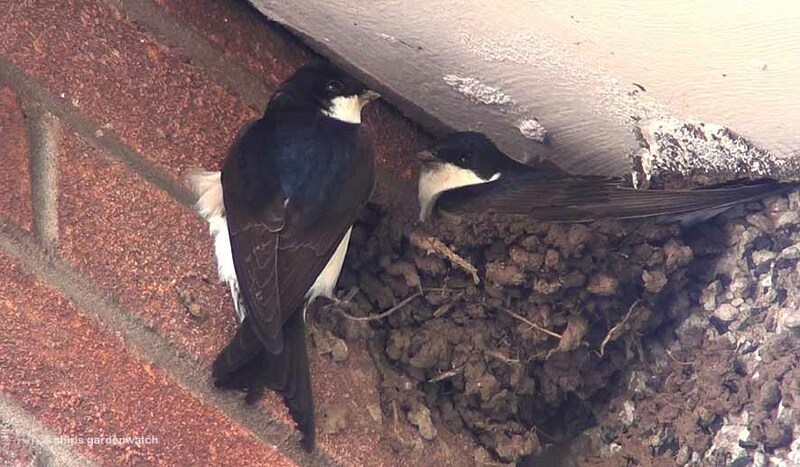 I look forward to the film of the House Martin nest. Lots of swallows in Angus. 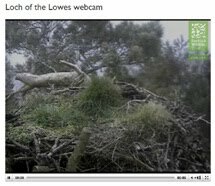 We usually see them nesting under the eaves o fthe buildings at the St Cyrus Nature reserve. Down the coast at Broughty Ferry there is a special sand marting wall which is fascinating to watch. We used to get house martins every year, they arrived around my elder son's birthday at the end of May, but for the last two years there have been hardly any. The BTO has a house martin survey, I think which might be of interest? 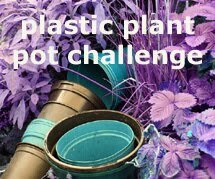 Just had a look at your lovely photos of your common spotted orchids in your garden. taking a closer look at the lip of the orchid I'm not certain that they are common spotted, the lip on a common spotted is divided into three lobes by deep wedge shaped incisions that extend about half way into the lip, your lovely orchids look like a type of marsh orchid, there are so many hybrids they are very difficult to identify. ONG, thanks for popping by! Yes, the bees are tricky. I guess I do stand a while and have my camera set to continuous shot. I get lucky sometimes with an almost still shot. Fun trying though isn’t it? David, thanks for your ID comments. I was hoping you’d have a look at this one. I’ve mislaid the plant label (bought at a garden show) and wasn’t sure if it might be a Marsh orchid. 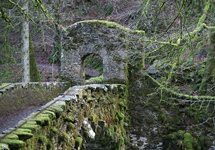 Just to say, as I mention in my post, I absolutely love to read of your walks discovering them in the wild. On holiday, I spotted Marsh ones in the wild for the first time. I was thrilled!